Chapter 40, of Little Women, is one of the saddest chapters in the story. Beth - the third daughter of the March family - has contracted an illness which will ultimately take her life. Louisa May Alcott, author of Little Women, also lost a sister. It must have been difficult, and perhaps cathartic, for her to write chapter 40. My dear Beth died at three in the morning after two years of patient pain. Last week she put her work away, saying the needle was too heavy ... Saturday she slept, and at midnight became unconscious, quietly breathing her life away till three; then, with one last look of her beautiful eyes, she was gone. ISSUES AND QUESTIONS TO PONDER: The March family goes through the death of a loved one in chapter 40 of Little Women. Times are different now, than they were in the second half of the 1800s, but do you think it is easier to lose a much-loved person today than it was then? Why, or why not? People grieve the loss of close friends and family members in different ways. Are you critical of the way in which the story unfolds in this chapter of Little Women? Why, or why not? The March family's grief, over Beth's illness and impending death, spills onto the pages of this chapter. Is that a maudlin way of viewing death - or - might it be a more experiential way (since the author was personally impacted by the loss of her own beloved sister)? If you were writing this chapter, would you have changed anything? If so, what would those changes be? Do you think that Beth - as described in this chapter of Little Women - plays a major, or a minor, role in the story? Why? Chapter 40 of Little Women - "The Valley of the Shadow" - is dramatized, in this audio clip, by Carole Bos (creator of AwesomeStories). The text is provided hereafter, so you can follow along as you listen to the words. The pleasantest room in the house was set apart for Beth, and in it was gathered everything that she most loved, flowers, pictures, her piano, the little worktable, and the beloved pussies. Father's best books found their way there, Mother's easy chair, Jo's desk, Amy's finest sketches, and every day Meg brought her babies on a loving pilgrimage, to make sunshine for Aunty Beth. John quietly set apart a little sum, that he might enjoy the pleasure of keeping the invalid supplied with the fruit she loved and longed for. Old Hannah never wearied of concocting dainty dishes to tempt a capricious appetite, dropping tears as she worked, and from across the sea came little gifts and cheerful letters, seeming to bring breaths of warmth and fragrance from lands that know no winter. Here, cherished like a household saint in its shrine, sat Beth, tranquil and busy as ever, for nothing could change the sweet, unselfish nature, and even while preparing to leave life, she tried to make it happier for those who should remain behind. If Beth had wanted any reward, she found it in the bright little faces always turned up to her window, with nods and smiles, and the droll little letters which came to her, full of blots and gratitude. The first few months were very happy ones, and Beth often used to look round, and say "How beautiful this is!" as they all sat together in her sunny room, the babies kicking and crowing on the floor, mother and sisters working near, and father reading, in his pleasant voice, from the wise old books which seemed rich in good and comfortable words, as applicable now as when written centuries ago, a little chapel, where a paternal priest taught his flock the hard lessons all must learn, trying to show them that hope can comfort love, and faith make resignation possible. Simple sermons, that went straight to the souls of those who listened, for the father's heart was in the minister's religion, and the frequent falter in the voice gave a double eloquence to the words he spoke or read. It was well for all that this peaceful time was given them as preparation for the sad hours to come, for by-and-by, Beth said the needle was 'so heavy,' and put it down forever. Talking wearied her, faces troubled her, pain claimed her for its own, and her tranquil spirit was sorrowfully perturbed by the ills that vexed her feeble flesh. Ah me! Such heavy days, such long, long nights, such aching hearts and imploring prayers, when those who loved her best were forced to see the thin hands stretched out to them beseechingly, to hear the bitter cry, "Help me, help me!" and to feel that there was no help. A sad eclipse of the serene soul, a sharp struggle of the young life with death, but both were mercifully brief, and then the natural rebellion over, the old peace returned more beautiful than ever. With the wreck of her frail body, Beth's soul grew strong, and though she said little, those about her felt that she was ready, saw that the first pilgrim called was likewise the fittest, and waited with her on the shore, trying to see the Shining Ones coming to receive her when she crossed the river. Jo never left her for an hour since Beth had said "I feel stronger when you are here." She slept on a couch in the room, waking often to renew the fire, to feed, lift, or wait upon the patient creature who seldom asked for anything, and 'tried not to be a trouble.' All day she haunted the room, jealous of any other nurse, and prouder of being chosen then than of any honor her life ever brought her. Precious and helpful hours to Jo, for now her heart received the teaching that it needed. Lessons in patience were so sweetly taught her that she could not fail to learn them, charity for all, the lovely spirit that can forgive and truly forget unkindness, the loyalty to duty that makes the hardest easy, and the sincere faith that fears nothing, but trusts undoubtingly. Seeing this did more for Jo than the wisest sermons, the saintliest hymns, the most fervent prayers that any voice could utter. For with eyes made clear by many tears, and a heart softened by the tenderest sorrow, she recognized the beauty of her sister's life - uneventful, unambitious, yet full of the genuine virtues which 'smell sweet, and blossom in the dust,' the self-forgetfulness that makes the humblest on earth remembered soonest in heaven, the true success which is possible to all. "Poor Jo! She's fast asleep, so I won't wake her to ask leave. She shows me all her things, and I don't think she'll mind if I look at this," thought Beth, with a glance at her sister, who lay on the rug, with the tongs beside her, ready to wake up the minute the log fell apart. As she sat with the paper folded between her hands, the charred log fell asunder. Jo started up, revived the blaze, and crept to the bedside, hoping Beth slept. "I know it cannot, and I don't fear it any longer, for I'm sure I shall be your Beth still, to love and help you more than ever. You must take my place, Jo, and be everything to Father and Mother when I'm gone. They will turn to you, don't fail them, and if it's hard to work alone, remember that I don't forget you, and that you'll be happier in doing that than writing splendid books or seeing all the world, for love is the only thing that we can carry with us when we go, and it makes the end so easy." "I'll try, Beth," and then and there Jo renounced her old ambition, pledged herself to a new and better one, acknowledging the poverty of other desires, and feeling the blessed solace of a belief in the immortality of love. Seldom except in books do the dying utter memorable words, see visions, or depart with beatified countenances, and those who have sped many parting souls know that to most the end comes as naturally and simply as sleep. As Beth had hoped, the 'tide went out easily,' and in the dark hour before dawn, on the bosom where she had drawn her first breath, she quietly drew her last, with no farewell but one loving look, one little sigh. With tears and prayers and tender hands, Mother and sisters made her ready for the long sleep that pain would never mar again, seeing with grateful eyes the beautiful serenity that soon replaced the pathetic patience that had wrung their hearts so long, and feeling with reverent joy that to their darling death was a benevolent angel, not a phantom full of dread. 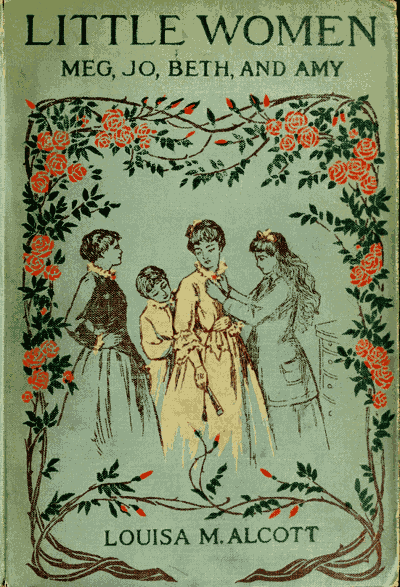 Chapter 40, of Little Women, by Louisa May Alcott. Dramatized by Carole Bos, creator of Awesome Stories. Bos, Carole "Little Women, Chapter 40 - Valley of the Shadow - Audio" AwesomeStories.com. Oct 07, 2013. Apr 24, 2019.